"Excuse me sir, can you foretell the future?" "Yeah, you won't pay me if I do" - actual anecdote from worldweary Indian street performer. If high-resolution discs cost a lot more than regular CDs, they won't sell. If high-resolution discs won't play in the your car, they won't sell. Retailers won't want to carry dual inventories. The way I see it, the winning format will have to be a hybrid disc; replace regular CDs; and sell for much the same as current RedBook. A year ago, the only format with a chance of successfully fulfilling that prediction was SACD. Dual-layer hybrid discs became available, albeit priced unconscionably high. Now you can acquire pretty much the whole catalogue of Bob Dylan and The Stones on SACD; with 6-channel compatibility to boot. The DVD-A camp hasn't exactly remained unawares of the promise inherent in a hybrid format. The first attempt, a two-sided disc with a CD on one side and DVD-A on the other, was a failure - the resultant discs were too thick to play on most CD changers. WEA engineers from Warner Brothers, Elektra and Atlantic Records are currently hard at work perfecting a thinner version which might premier in sample form next month. I'm told that many technical difficulties remain to be worked out. But if the developers should be successful, it's likely that the major record companies, including Sony, will back this new discrete two-in-one format. How would retail pricing be positioned? That I don't know. Here's what I do know: I'd like to see it happen - for then we'd really have a horse race. That's why I was interested in reviewing a true universal player, the Holy Grail that would play DVD-A, stereo/multi-channel SACD and CDs. Considering the plethora of recent universal machines, with many selling for a few paltry hundreds of dollars, I had one proviso that drastically thinned out the herd of contenders. You see, I believe that there's no advantage in buying a high-resolution music machine unless it were capable of better sound than the best equivalently priced dedicated CD players. Asking for too much? Let's see. Sony doesn't yet offer such a machine. Their high-end SACD XA777ES at $3,000 has been very successful, with some calling it a match for any $3,000 CD player while addressing standard RedBook extraction. While that meets some of my objectives, it overlooks DVD-A; as does its successor, the SACD XA9000ES, which is reaching the market just about now. Krell markets separate SACD and DVD-A players but not one machine that would play both. 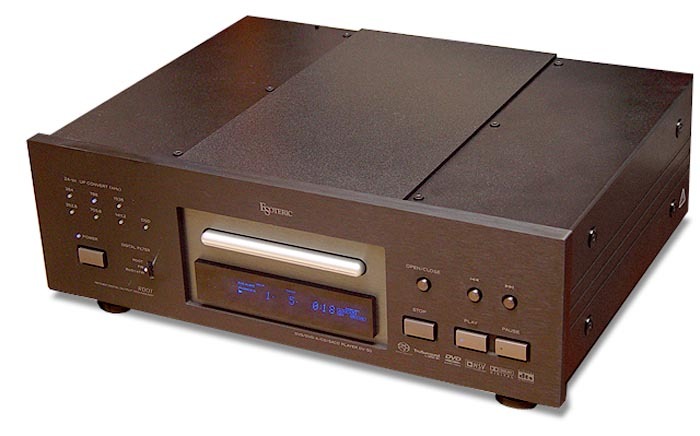 The Musical Fidelity TriVista SACD player doesn't handle DVD-A either and is limited to 2-channel SACD playback. The various Denon, Philips and Marantz universals I've heard don't compete with the best CD players at the same price. Enter the Esoteric DV-50. Here's a player that sets out to proudly meet my challenge. It's a high-end CD and no-holds-barred universal player. Thanks to the good folks of TEAC/Canada and Francis Chung of Toronto Home of Audiophile, I can now share my findings with you. Mind you, this will be based purely on the 2-channel audio side of the equation. The additional 4 channels and DVD video angle (superb I hear) will be icing on the cake if the DV-50 met my 2-channel audio criteria. It arrived in one big heavy chassis, weighing a shocking 47 lbs. and measuring 17.4" x 6.3" x 13.9" WxHxD. My test unit arrived in black, but a silver version is also available [US market excepted!]. Considering the complexity of the machine, its front panel simplicity is remarkable - buttons for power, open/close, stop, play, pause, previous and next track. That's it, safe for one additional 3-position toggle that selects the digital filter in CD/DVD-A modes. Each control is large and well placed and reacts with a luxurious feel. Below the silver-dressed, centrally mounted composite drawer is a blue-lit display which recognizes the type of disc in the tray and responds to how many times the 'display' button on the remote control is pressed. A set of indicators above the left master power switch confirms chosen filter and SACD processing. The rear of the machine divides into upper and lower sections, with well-spaced XLR and RCA two-channel outputs and IEC inlet above; D-video/component/S-video/video, six-channel audio and optical and coaxial digital outputs and ground post below. Strangely, the manual warns to not use any power cords other than the one included, to avoid fire, electric shock, etc. Fortunately, I didn't pay attention. Neither will you, I'm sure. One part of the manual I did pay attention to specified the output level as 2.2 volts for both balanced and unbalanced 2-channel outputs. Listening indicated that the balanced output was much higher than the unbalanced, well over 4 volts. Being one of the very few hard specs TEAC decided to include in the manual, this discrepancy is odd. The manual is remarkably slender for the complexity of the beast it purports to describe. I would like to have seen far more information on the three digital filter options, and to learn how to access a hybrid SACD's CD layer. Alas, I never did. Still, the player was remarkably easy to use. The only calibration you need to perform to have the DV-50 substitute for your current two-channel player is to set the menu to CD-direct and turn off the multi-channel outputs. Then load a disc, any disk, and the DV-50 will do the rest. The drawer moves very fast, and I have never heard a quieter drive. Correction - I never heard this one at all, even with my ear pressed up against it. However, I could detect slight vibrations at various points on the top cover. I used 3 GutWire NotePads (see Paul Candy's review) to address these resonances, leading to a noticeable improvement in sound. The remote control has a nice heft to it, with clearly marked and responsive buttons. Scan and track commands could have been larger since they're placed in the fourth row which starts a field of 16 same-sized buttons. Play, pause and stop are clear and large, however. The direct track-access number pad is on top and easy to use. You will be pleased to learn that the DV-50 accesses the TOC of any disc within 6-7 seconds, much faster than the snail's pace of early SACD machines. 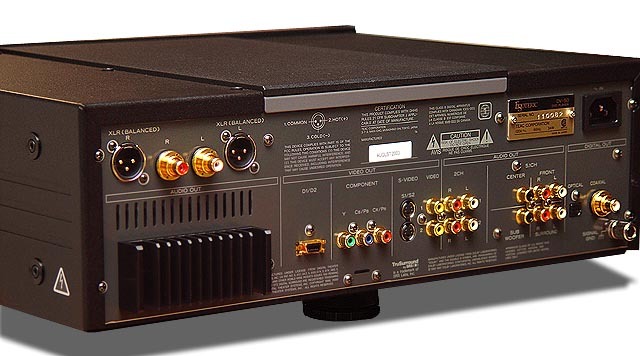 When used in 6-channel mode, the DV-50 operates with 6 independent 24-bit DACs. In two-channel mode, the RDOT and FIR filters may be selected in tandem or independently, with the former upconverting CD to 705.6 kHz and DVD-A to 768 kHz regardless of the original sampling frequency. FIR operates as 8 x upconverter to obtain 352.2 kHz for 16/44 CD and 768 kHz for 96 kHz DVD-A recordings. RDOT + FIR nets 1411.2kHz for RedBook and 1536 kHz for DVD-A. Post filter, the 2-channel signal is fed to 4 DACs for dual-differential balanced operation. The master clock employs a high-precision voltage-controlled oscillator on the audio board to reduce jitter. A high slew-rate National Semiconductor op-amp performs current/voltage conversion while Analog Devices op-amps synthesize the differential signals for the single-ended outputs. and 3D motion adaptive processing. Three feet with fully enclosed steel pinpoints provide mechanical grounding to render after-market supports redundant. With the physical inspection completed, I would now pit this player against the GamuT CD 1S, priced at around 2/3 of the Esoteric but competing against the very best one-box integrated players in sound if not construction. The remainder of the system consisted of the Perreaux R200i integrated amplifier, my trusty Wilson Benesch Act 1 speakers and SoundString cabling.